When it came to soapy nighttime TV drama, "Dallas" was the gold standard, and now it's back (two-hour series premiere airs Wed., June 13, 9 p.m. ET on TNT and on Bravo in Canada) with some familiar faces and a few updates. Whether you watched the original "Dallas" or not, it's been over 20 years since we said goodbye to Southfork, so a little refresher course is in order. Of course, there's too much drama, countless torrid affairs and more illegitimate kids than we can count -- like Bobby's one biological child Lucas (who he had with his first love, Jenna), who was later adopted and raised by Jenna and Bobby's father's illegitimate child Ray Krebbs. (Phew!) 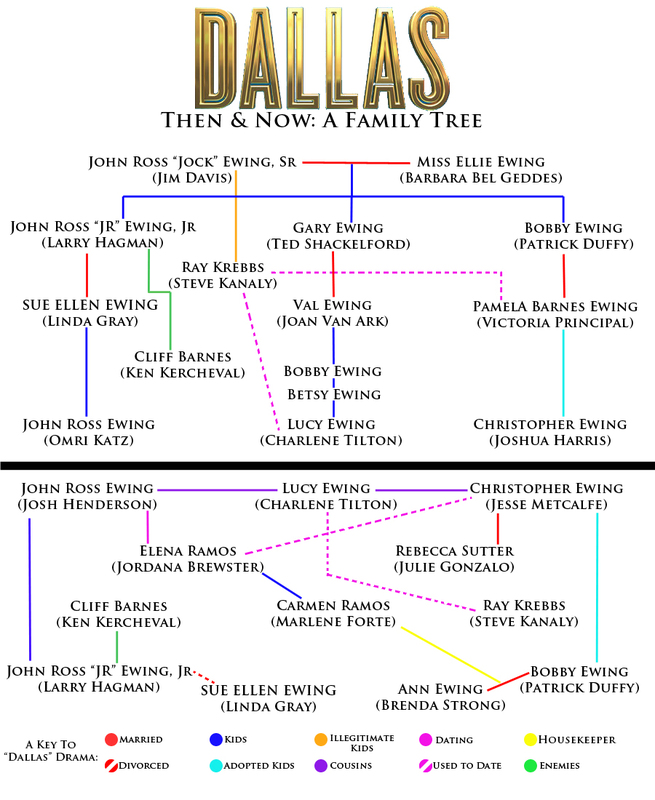 But we've mapped out a very simplified family tree of the show's most essential connections, then and now. Tell us: Were you a fan of the original "Dallas"? And are you excited for the "Dallas" reboot?